Electron is an open-source project from GitHub that lets us create cross-platform desktop applications with web technologies. It doesn't matter which specific framework we use; if it works for the web, it works for Electron. 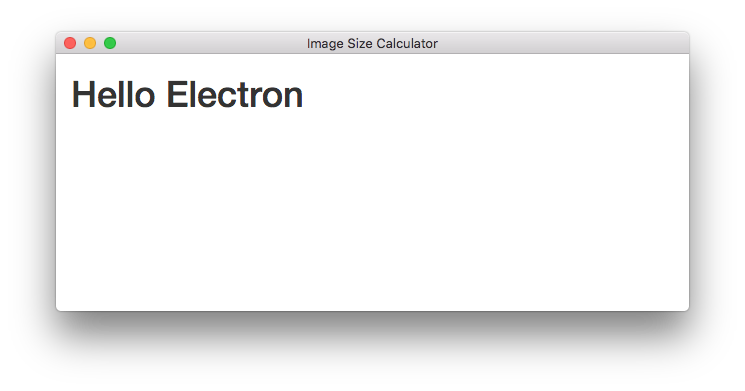 We can use Angular 2 for Electron apps, and in this tutorial, we explore how to get a desktop image size calculator app wired up. Check out the code on GitHub. You can also check out our other Angular 2 material, including tutorials on working with pipes, models, and Http. Developing desktop applications is arguably harder than developing for the web. Throw in the fact that you would need three versions of the same desktop app to make it available for all the popular operating systems, plus all the work that needs to go into preparing for distribution, and it can be a daunting task for web developers to port their skills to native. This is where Electron comes in. In this article, we'll explore how to wire up a simple image size calculator app using Electron and Angular 2. While the steps here are specific to Angular 2, remember that any front end framework will work with Electron, so these instructions could be adapted to make use of others. We'll use Webpack for our Angular 2 setup, and we'll base the config loosely on the awesome Angular 2 Webpack Starter by AngularClass. Let's start with our package.json file to list our dependencies, along with some scripts that will let us easily run our webpack commands and also run the electron command to start the app. Next, we need some configuration for Webpack. We're telling Webpack to bundle up the Angular 2 scripts and serve them from a single angular2.js bundle that will be in the build directory. The scripts for our app will be served from a separate bundle called app.js. We also need some TypeScript configuration in a tsconfig.json file at the project root. All the files specific to our application will live inside the app subdirectory. There, we need to provide a package.json file that will simply tell Electron which script to use for bootstrapping. This will be the main.js file, and in it, we will tell Electron how to open and close our app. Now let's configure the application window. The main.js script is really just some boilerplate that Electron needs to fire up. We are keeping a reference to mainWindow so that garbage collection doesn't interfere and close the window on us. We create a browser window with specific dimensions and then load an index.html file from the app directory. Let's create this file next. Just like with a regular web app, we need an index.html entry point. Aside from angular2-polyfills.js, The scripts that we're referencing aren't actually there yet, and that's because we haven't run our webpack command to generate them. The last thing we need to do before bundling our scripts is to create an empty app.ts file, as this is what our webpack.config.js file expects. With an empty app.ts in place, let's bundle the scripts. This command was set up in our package.json file in the project root, and it runs webpack with some options. One of these options is to watch for changes, so we can now edit our app.ts file and everything will automatically get bundled again. If we look in our project root, we should now see our build directory. With all these files in place, we should be able to run the app. Remember that we've set up a command in our package.json file to do this. If everything is wired up properly, we should now see our "Hello Electron" message. Our simple app will let users drop images in so that they can find out their sizes. Why wouldn't they just check the image's properties? Good point. However, this app will give us a chance to see how Electron adapts web APIs for the desktop. Let's create the dropzone first. We'll do all of our Angular 2 work in one top-level component. To define some custom behavior for dropping an image into our app, we need to first pass false to the dragover and dragend events. The drop event is what we want to hook into, and for now we are simply logging out the details of the images we drop. That's right--we can see the same dev tools that we would in Chrome. If you're on a Mac, just do Option + Command + I to open them up. Note that to get hold of the event information for the drop, we pass $event, just like we would in Angular 1.x. So how are we getting this information, exactly? 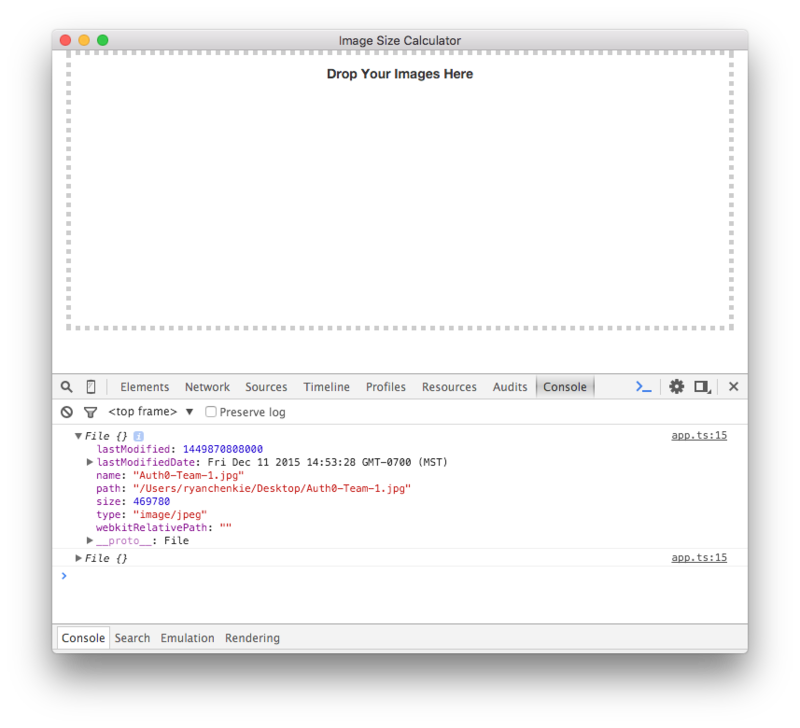 Electron provides an abstraction around native files so that we can use the HTML5 file API. With this, we get the path to the file on the filesystem. This is useful in our case, because we can link to our images and show them in our app. Let's set that up now. Let's now put in some templating to display the images. For this, we'll want to use ngFor to iterate over the images we drop in. Note: As of Beta, templates are now case-sensitive. This means that what used to be ng-for is now ngFor. 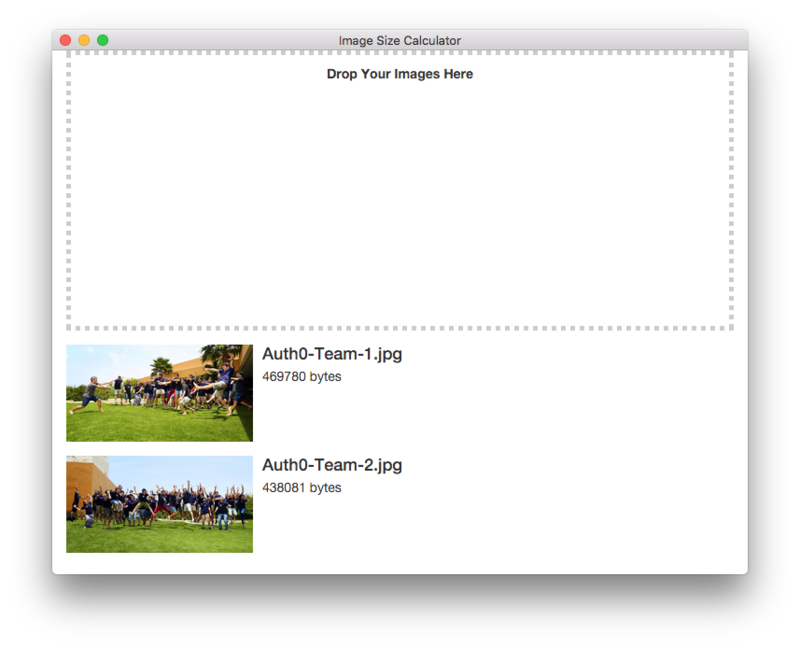 Now we push the dropped files onto an array called images and iterate over it in our template to get the details. To avoid other file types being dropped in, we are only accepting png and jpeg. 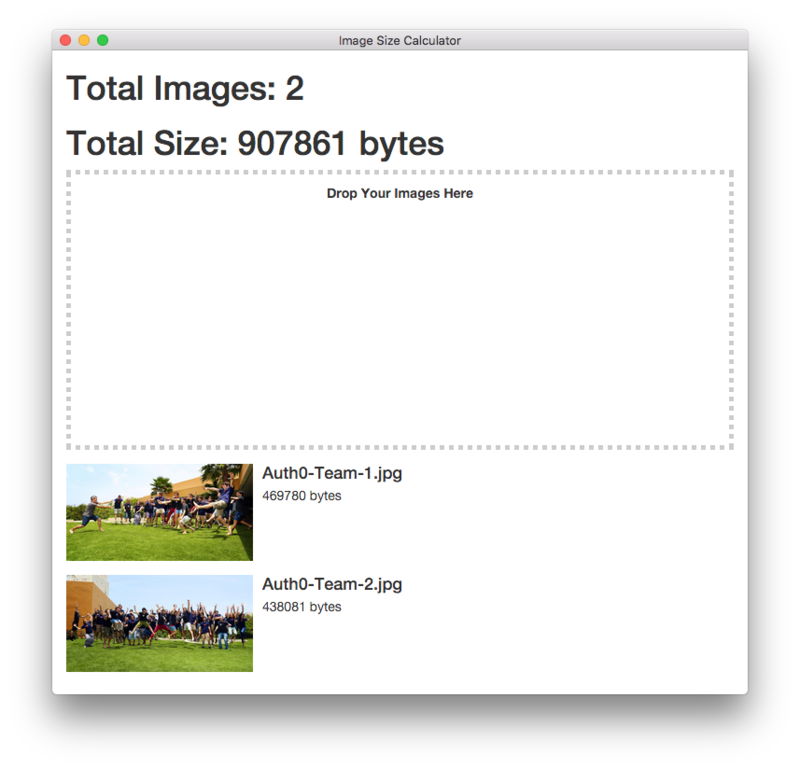 We want to have a way to display the total number of images dropped into the app, as well as the total size of those images. For this, we can create an imageStats function that returns these details. We're getting the number of bytes for each image, but ideally we would be able to get them in different units. It would be great if we had something to automatically convert the bytes to KB, MB, and GB, and display the appropriate units. We can do this easily with a custom pipe. This pipe checks for the file size in bytes and returns the appropriate conversion. We then just apply the pipe to our template and we're able to get the desired output. When distributing Electron apps, it's essential to generate an archive of the application files so that the source code is concealed. This can be done with the asar utility. The archive file can then be used for the app, and it will be read-only. We'll obviously want to change the name of the application and also provide a unique icon. Instructions for this, along with the other steps involved with distribution, can be found in the Electron docs. No matter which framework you use with your Electron app, you can easily add authentication to it with Auth0! Our Lock widget allows you to get up and running quickly. Sign up for your free Auth0 account to work with these directions. Before getting started with the code, you'll need to whitelist the file://* protocol in your Auth0 dashboard. This can be done in the Allowed Origins (CORS) area. To begin, include the Auth0-Lock library from the CDN and provide a button or other element to hook into. Next, create a new instance of Lock and set window.electron to an empty object to trigger the proper login flow for Electron. Finally, trigger the Lock widget to be shown when the user clicks the Login button. In the callback, set the returned user profile and token into local storage for use later. // Success calback. Save the profile and JWT token. With the token in local storage, it can now be used as an Authorization header to access secured API endpoints. The way to attach the header to HTTP calls differs depending on which library or framework you're using. If you're using Angular 2 in your Electron app, you can use angular2-jwt. Follow the steps in the Angular 2 docs for more details. Not using Angular 2? We've got intergrations for many other frameworks and libraries as well! Electron offers developers a way to create desktop applications with the web technologies they already know instead of needing to learn new languages that are specific to various operating systems. This is great, because skills can easily be ported, and code can be reused. Electron doesn't care about which framework we use for our apps. Even though it's in beta, Angular 2 is a great framework to use inside an Electron app and, once everything is set up, works just the same as if we were developing for the web. Published at DZone with permission of Ryan Chenkie , DZone MVB. See the original article here.